Is Spring finally going to arrive??? Seems like its been ages ago we have seen a streak of 60's around these parts with many cities in this region having yet to hit 65F, let alone 60F, which is rather dismal. I think this changes as we open up the first week of the month and my target dates centered around the 6th/7th will play out pretty well. Overall, I'm starting to feel that this month will feature a very volatile month and that sustained ridging won't be as common as the CFSv2 is illustrating, esp across the northern Sub. I do feel there will be plenty of storm induced warm spells but if the blocking sets up in the longer range (which is starting to show more signs of doing so), it may mitigate how long these warm spells may last. Unfortunately, these late season blocks wreck havoc on the models to try and figure out so we'll just have to wait and see how this all plays out. The LRC pattern suggests the active pattern should continue throughout this month and systems are lining up during the 1st couple weeks with a lot of precip across the heartland. I'm really concerned for the ag belt region as it may be a season where planting is delayed again this year with wet/cold soils. Storm chasers will be gearing up for their chases this month and I'm highlighting the S Plains/MW/OV this month. I"m thinking the central Plains on north will escape the worst of the Severe Wx this month. Jim Flowers did a severe weather video yesterday he said the bulk of severe weather won't arrive until July for Nebraska. Not sure if that will play out but that is a big delay if it does. Gotta say I disagree with him here. Looking like a slightly above average April. Bring some moisture into that going into May and boom, severe wx. While I don't disagree the temperature profile is looking weak and the low level jet is looking to far south. The extent of the warmth around the 6th/7th period is looking transient as high lat blocking is noticeable now among the various models. My fears of the CFSv2 long range warm signals are beginning to fade slowly. Tonight's Euro weeklies should be interesting to see if this Greenland Block pops or not Week 2 and how long it lasts this month. Doesn't it seem like these late season blocks seem to always show up in the worst ill-timed Spring months??? 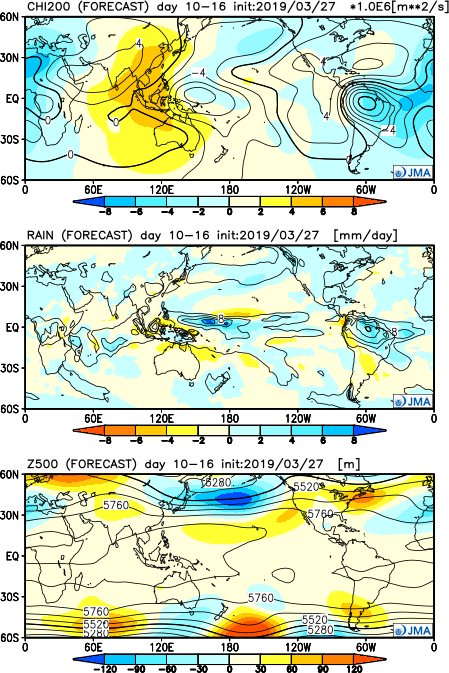 Nonetheless, a very active/wet pattern is shaping up during the first half of April across the Sub Forum. 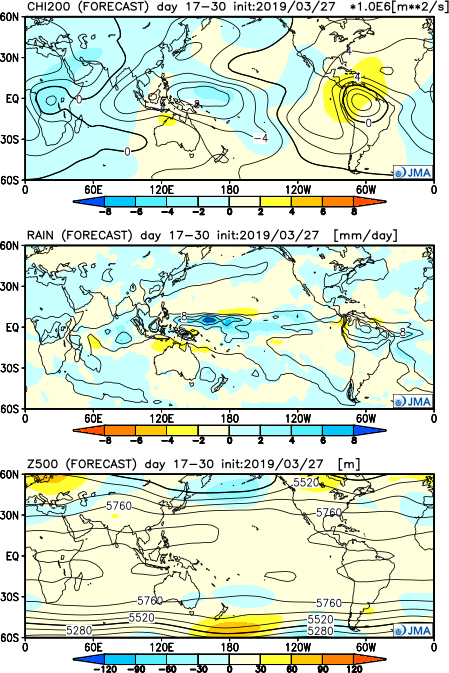 The latest JMA weeklies for the Week 2 period are looking simlar to the EPS and developing a hooking ridge over the top of the lower 48 that'll keep the storm in tact. The question remains, how warm does it truly get??? Looks much better than last year that's for sure. First week actually looks above average, though I predict temps will finish within a degree of normal in the end. Good. Let's get it over with early rather than baking and sizzling in July and August, when we REALLY bake and sizzle. Finally, I'm beginning to see some consistency among the models that the period between the 6th-11th we see an end to the yo-yo pattern and flourish into REAL Spring by next weekend. Many places will see a string of 60's and likely 70's in the Plains states when this ridge blossoms. I'm glad to see the long standing idea coming more into fruition that sensible warmth is on the horizon. This back and forth pattern is getting old around here and these 1-2 day bouts of warmth are just that...a nice tease of Spring. Who's ready for a nice Spring torch??? There is a big ticket storm on deck during the 10th-12th period coming out of the S Plains into the heartland of the nation. I'm reluctant to say, but this could be a big heavy precip producer where we don't need it. Let's see how this pattern evolves in the coming days. Snowing in KC this morning following 1-2 inches of rain which we did not need. We have a complex of ball fields that we take care of that are still under water from the river flooding. League play opens in 3 weeks, not sure if this park will be ready. Hopefully April will be warmer with more gaps in the rainfall. This upcoming week looks much warmer then it has been. Everything greened up quickly down here. Nothing has bloomed yet so the hard freeze tonight won’t matter too much. Hopefully, we bake and sizzle in July and August. Currently it's cloudy, gusty winds. You can tell that Spring is on full throttle. A flock of robins met me this morning in the yard and golf course. They're on their way. The new yellow green leaves waving against the dark clouds are just gorgeous with a speck of sun on occasion. You can always vacation in Texas if you don't!! No thanks, I don't need $200 electric bills like I had last year. Same here. When I used to live in NYC, I used to pay 400 or more a month. Crazy! Holy smoke. Why so high? We don’t even get that in 100*+ in Texas. By the way.......any thoughts on how many 100* days we’ll see down here ??? Another ugly, chilly, slow moving and wet system is taking aim mid/late week across the same regions week that saw heavy rains over the past couple of days. The storm parade doesn't stop there as the models have systems traversing the heartland every 2-3 days which is in-line with the LRC. A more interesting storm is on my calendar during the 10th-12th period that should come out of the SW into the S Plains/MS region. There is some strong indication that blocking will have immersed across the north and could spell more wintry trouble for some folks across the northern tier of the Sub. Before then though, I sure hope the Euro is right as its advertising upper 60's/low 70's across a lot of the Plains/MW/GL's next weekend. This pattern appears to be active, but as these storms approach the region they are fading into a bit of light rain. I've only received 0.32" of precip over the last two weeks. The midweek system is trending south, just like the last one. Last night's euro barely drops anything here. We may have to wait til mid month to see anything decent. We could use a nice downpour to wash away all the sand. Always favor the Euro over the GFS, any time of the year in any pattern. I agree, and it's not looking warm Week 1-2...heck of a lot different that the GEFS in this pattern. Every run of the euro is weaker and farther south with the midweek system. The euro now has zero precip here Tuesday from the weak clipper and also zero precip with the formerly-solid midweek system. The system a week from now will probably fade to nothing, too. On the plus side, the new euro has mid to upper 60s from Sat-Tue. Our forum pal Phil, retweeted a comment on his Twitter account from someone he follows. Thought I'd toss his comments out for comment. Good morning all! Who's already looking forward to the weekend?? 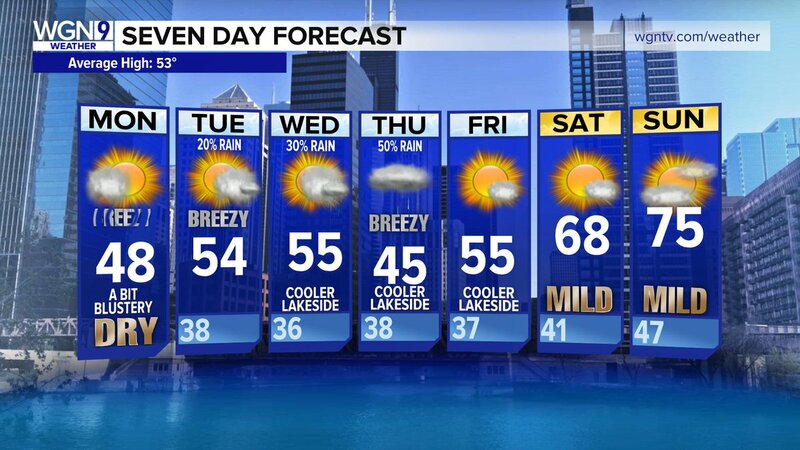 Now, this is a weekend forecast I've been looking for quite some time....Chitown will be buzzin'....I'm just hoping that sneaky wave from the southern Plains doesn't ruin the parade to top 70F for the first time this season on Sunday around here. This weekend should feel wonderful with full sun and southerly flow. I'm starting to see spotty green patches on my lawn which is trending in the right direction. After our weekend torch that bleeds into early next week, the fun stops right there as we enter an anomalous blocking pattern across the Arctic and esp near Greenland. We haven't seen the models this excited about advertising blocking since way back in the Fall of last year. It seems like in recent years, as the jet weakens, we see these late season blocking patterns more and more often. Is it a sign of the times in years ahead??? Too early to say, but its becoming very noticeable. 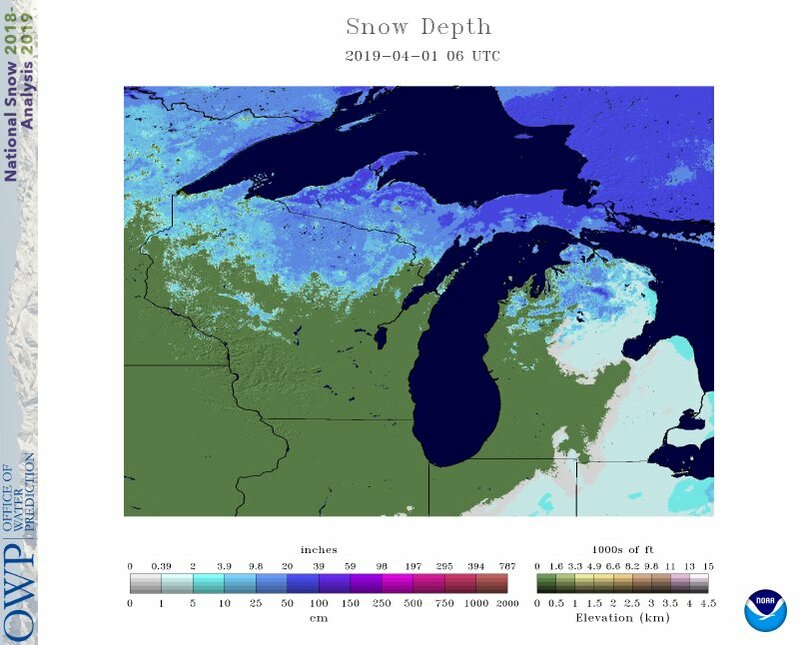 This ain't no April fools joke as there is still quite an impressive snow pack across the Northwoods as we begin April. Meantime, it's another cold morning around here (26F) with clear skies as daylight begins to emerge. Sun rises are becoming noticeably earlier each week. I'm just imagining what a difference it will feel like this weekend immersed in 60F+ temps. When I was in Fargo last week it was still 2' deep in some spots. Near nothing around Duluth/Superior, though. I'm sure it's gone down considerably since I left there about a week ago. Yeah weekend looks great. Definitely gonna take advantage of that and get some stuff done outdoors. Here is the snow on the ground as of Friday AM in Michigan: 38" 5 miles west of Michigamme, 37" Painesdale, 28" Munising, 27" Calumet, 26" Kearsarge, Herman, 24" S. Ste. Marie, Marquette, 22" Newberry, 21" Champion, Houghton, 20" Atlantic Mine, 16" Moran, 14" Covington, Garden Corners, 13" Harvey, Gladstone and Parent Bay, 12" Watersmeet, 11" El Jordan, Paulding, Jacobsville, Watton and Ishpeming, 10" Mancelona, Manistique, 9" Lewiston, Amasa, Green Garden, 8" St. Ignace, 7" Gaylord, Ironwood, Stambaugh, Norway and Stonington, 5" Chatham, 3" Escanaba, 2" Charlevoix, Maple City and Onaway, 1" Mio and Alpena. Now that we are in April here is a preliminary March wrap for west Michigan. At Grand Rapids the mean was 32.2° that is a departure of -3.4° the highest for the month was 61 on the 28th the lowest for the month was +8° on the 8th the maximum of 14° was the 2nd coldest maximum for that date. There was 7.9” of snow fall (average is 8.3”) the most on the ground was 6” While the ground has been mostly snow free since mid month there are still a lot of parking lot snow piles around the area. The total precip for March was 2.23” (2.37” is average) there were 8 clear days 12 partly cloudy days and 11 cloudy days. The last two weeks managed to finish above average in this parts even with the weekend "cold shot". I would expect the yoyo to continue with warmth skewing averages above normal. It’s been BN over here the last couple weeks. You guys did better the father NW. I’m not to thrilled the way the pattern looks at this point next week. I see a yo yo week with the warm start having larger departures than the cool end. Been pretty normal in the Chicago area for the last two weeks. Def not cold by any means. I think March 2012 screwed up people's perceptions on how a normal spring should be. The past few springs (other than last year) have been very normal. This time of year, below normal doesn't necessarily mean cold anymore. I know here, a high of 55 is below normal this time of year now. Really nice weather till Saturday, then rain........Lord! That sounds dull. Nobody said it was cold, but certainly ended up BN around here and points E/SE. Meantime, 12z EPS continues to suggest a very wet and largely BN temp pattern across an extensive area of our Sub Forum. I wouldn't be surprised if it snows in the Dakotas and up through MN/WI by mid April. Crazy pattern setting up. In NYC ya'll. Currently at 48F w mostly sunny skies. April snow is not crazy in minnesota. I would be surprised if we don't get any. Euro weeklies show a largely below average rest of April once we get past the first 10 or so days. The middle of April is notably cold, whereas we end April on a mild (too mild to say "warm") note. The nice weather continues into May. 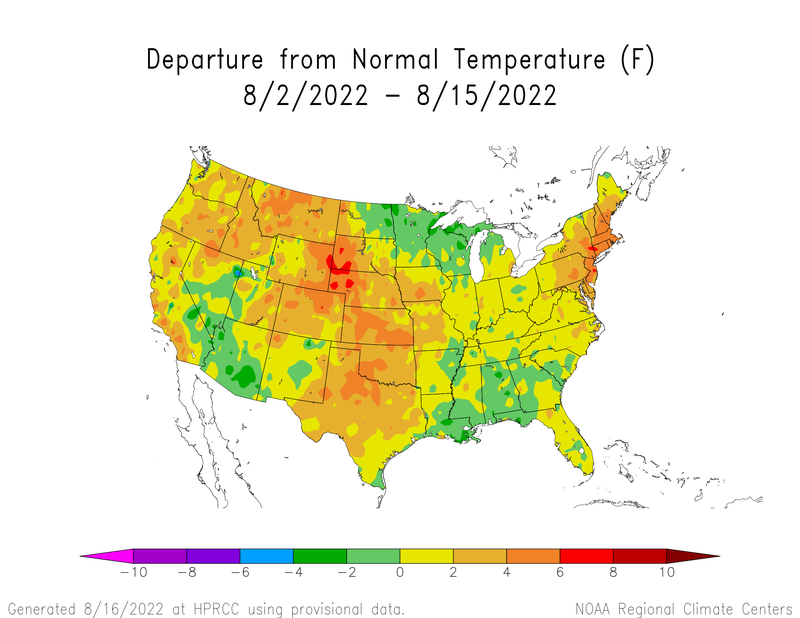 Bad news for severe wx buffs but good news for those who don't want Summer coming quite yet. Severe weather season around here doesn't even really seem to get kicking in this area until mid to late May anyway. It seems to really intensify the first couple of weeks of June (always around the College World Series it seems). I am okay with the current pattern, warm days (50s and 60s) and cool nights (30s and 40s) are my favorite. In my area I would say it was very normal once we got past that crazy cold arctic air in early March. It was so cold early on, that March still ended up around 4.5° below normal at my location. But it sure felt a sight better & seemed like a big pattern change after March 10 or so!